It is my great pleasure to have been serving as Priest and Rector of this Parish Church of St. Matthew since September 15, 2013! Since then, I have come to see that God's Spirit is alive in this place, in many profound and wonderful ways. This is a faith community that has developed deep bonds of affection for one another, and has acquired a sensitivity and passion for addressing the needs in the world around us. I know that you will be greeted with warmth and sincerity whenever you visit, and you will be gently encouraged to become a fellow pilgrim with us. 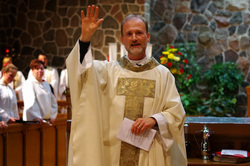 St. Matthew's Anglican Church seeks to be a vital and loving presence in South Windsor. I invite you to come and experience what this looks and feels like for yourself!